I've finally perfected my banana muffins! I am very picky about muffins so please don't think this is just another boring, run-of-the-mill banana muffin. Not only do these taste amazing, but they also use my secret baking ingredient, buttermilk. Enjoy! 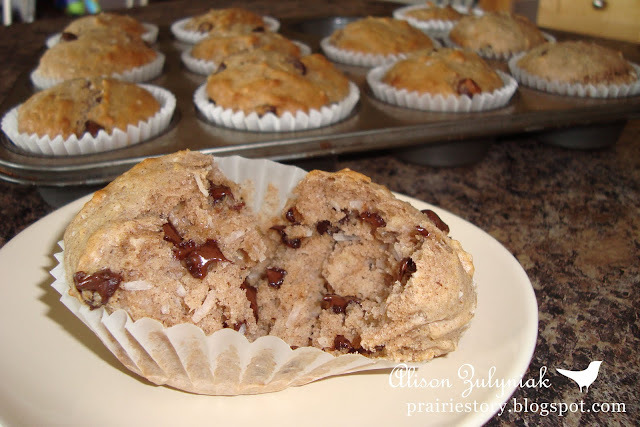 Be sure to read all the rave REVIEWS: Chunky Monkey Banana Muffins. - Beat together eggs and sugar. Then add in vanilla, mashed bananas, buttermilk and margarine. - Mix in dry ingredients. - Fold in coconut and chocolate chips. - Fill lined muffin tins 3/4 full. - Bake @ 350° for 20 minutes. Tip: If you don't have buttermilk on hand, add 1 tablespoon of lemon juice or vinegar to milk and let stand for 5-10 minutes. Glad you enjoyed them. My banana supply in my freezer is getting out of control again, so I think I'll have to bake up a batch this weekend! These muffins are moist and tasty, and easy to make. The muffins are even better the next morning. You won't have to worry about leftovers.